A great way to draw attention to your storefront or take advantage of all available advertising space at event locations is to use all of the available space – windows, doors, walls, floors, and more! 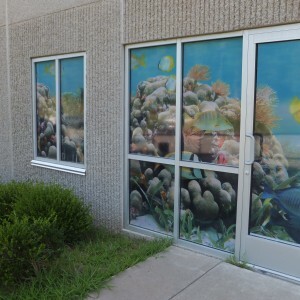 A good UV window film will allow you to graphically display your brand message or promote your products and services as your target audience passes by your storefront or event space, and since there are glass windows, doors, and more at commercial spaces nearly everywhere, utilizing these spaces for your advertisements opens doors for you to expand your branding and grow your business to new heights. At Ultraflex Systems, Inc., we have an outstanding perforated window film, UltraVision® Window Perf 60/40 UV, that is compatible with solvent, eco-solvent, and UV printing. As with all of our innovative product releases, UltraVision® Window Perf 60/40 UV has unique features not found in comparable products. Featuring a specially-designed release liner that catches excess ink during printing, you can rest assured that your graphics will preserve optimal two-way viewing and be bright and vivid without obstructing any of the perforation throughout your design. Ultraflex Systems, Inc. is a leader in the digital print media industry, and thousands of businesses worldwide rely on our best-in-class window film and other products to help them spread the word about their brand, business, product, and services. Our products are seen in advertising campaigns in Time Square, at sold-out concerts across the globe, at resorts worldwide, and more. We offer a broad assortment of front-lit, back-lit, and blockout media to mesh banner material, specialty materials, textiles, and more to help you make the most of every space, and we have products that allow you to help you brand every inch, including your floors, walls, windows, and doors. If you are looking for the best-quality window film in the USA, England, Scotland, Mexico, Canada, or anywhere worldwide, we can help. Contact us today for more information.